Don’t Get Chilled to the Bone this Halloween! Is it just me or does it always seem to get cold (and often rainy) just in time for Trick-or-Treating, Halloween Parades and other fun outdoor Halloween festivities? Let’s be prepared to stay warm as temperatures dip into the low 40’s and as the rain rolls in. 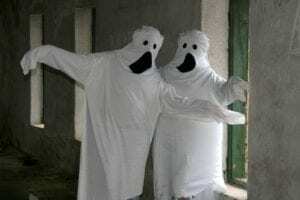 Before you and your little trick-or-treaters head out this Halloween, take a few pictures of everyone in their costumes, then add on a coat and/or sweat shirt. Once the sun goes down it will be too cold for your little ones to bare without an extra layer or two. Pro Tip: If your child absolutely refuses to cover up their super cute costume with a coat, try getting them to put a sweat shirt on underneath their outfit for added warmth. But remember to still bring that coat along with you; you’ll be glad you did! 2. Things you’ll want to bring with you. The radar might say that you’ll miss the rain while trick-or-treating or at the parade, but is your luck really that good? It’s better to pack a small umbrella for your own peace of mind. And those Halloween parades can get mighty chilly once the sun goes down, so you might want to bring a couple of extra blankets for your comfort. 3. You can’t control the weather outside, but you can have the perfect temperature waiting for you at home! Coming home to a nice toasty house after being outdoors for long hours this Halloween will be a special treat you give yourself! You’ll want to ensure that your furnace is running properly and ready to keep you and your family warm. 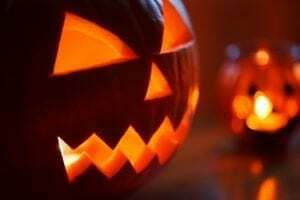 That’s why we’re offering you a little Halloween treat of our own! 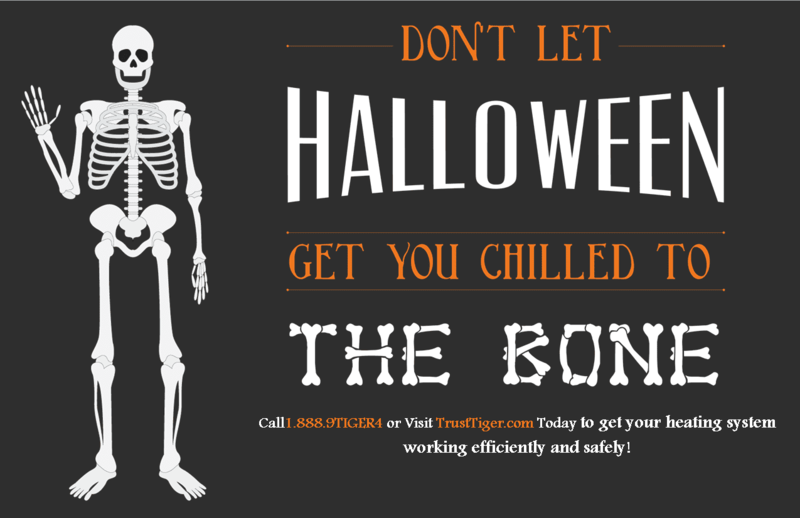 To have your furnace inspected by a professional to ensure you don’t have to worry about your heating system failing you this Halloween call 1-888-9TIGER4 or visit TrustTiger.com today! 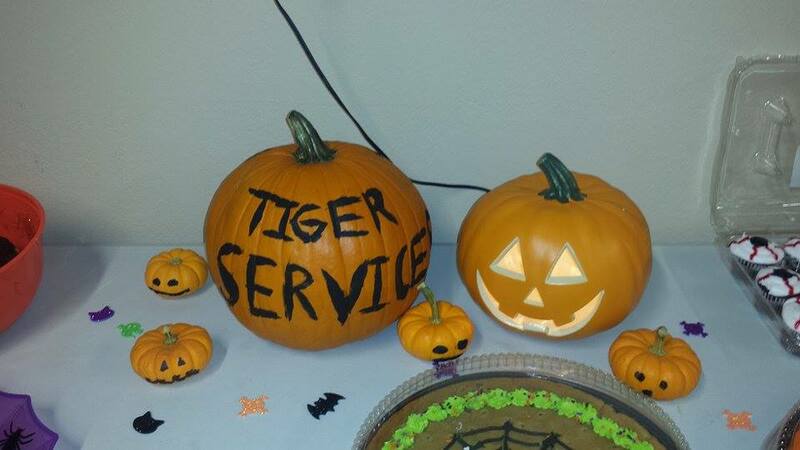 Happy Halloween from everyone at Tiger Plumbing, Heating, Air Conditioning & Electrical Services! The scariest thing waiting for you this Halloween is your power bill. Fortunately, scary Halloween creatures like ghosts, vampires and zombies are make-believe but your overpriced power bill is all too real. 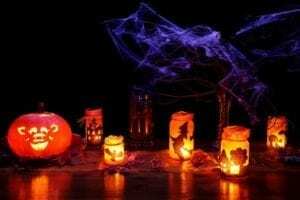 This Halloween let’s take some of the scary out of your monthly power bill with these great money saving tips! 1. Scary movies keeping you up late this Halloween? Horror movies are great, but let’s face it, it’s not the scary monsters that are haunting your dreams. No, it’s the added cost from all of those extra TV hours will add to your electric bill. If you know you might fall asleep in the middle of a movie, set your TV’s timer to shut off for you. That way you won’t waste hours of extra electricity while you’re sleeping. 2. Is the thought of heating your home scaring you to death? An inefficient running heating or cooling system is a huge expense to any homeowner. If your heating system is constantly requiring service or if it’s over 17 years old, it’s probably time to start thinking about replacing it, before winter weather sets in. A new furnace is a great way to save money and make your power bill seem a lot less scary. 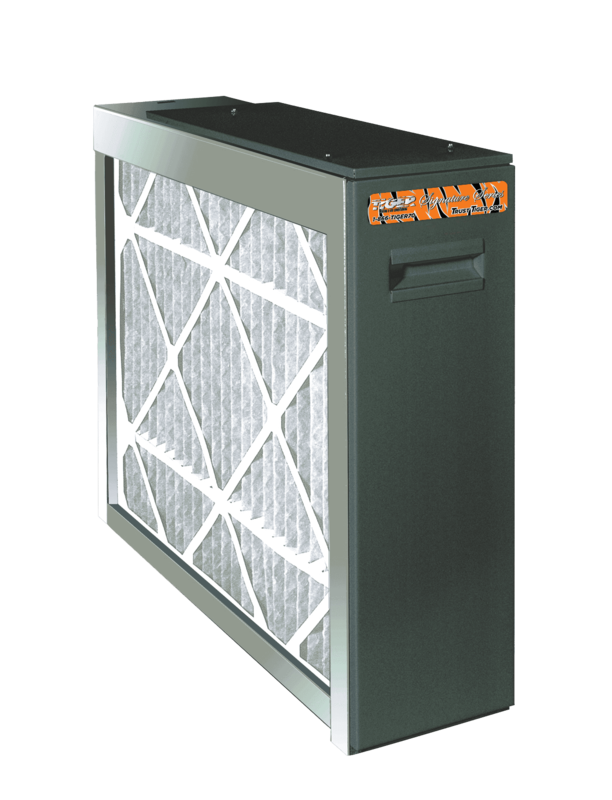 To have a professional explain how you can save real money on a new furnace call 1-888-9TIGER4 or visit us online today! During the long winter months ahead, when the weather is just so miserably cold and gross, you can help keep the cost of heating down by keeping the draperies and shades on your south-facing windows open during the day. This will allow the sunlight to enter and help warm your home. Then you should keep your drapes closed at night to reduce the chill you may feel from cold windows. Remove trapped air from hot-water radiators once or twice a season; if unsure about how to perform this task, contact a professional. Turn off lights when you leave a room or when you don’t really need them. This is a simple way to save some money on your power bill. 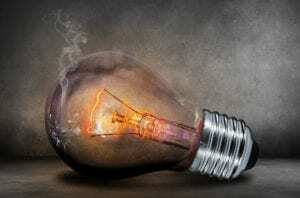 Any home owner knows that electrical work and maintenance is a necessity. It can also be fairly pricey! The good news is that there are ways you can help keep the costs of electrical work down. You can save time and money on electrical work by bundling projects together. Keep a running list of electrical problems or needs in your home. Then when you call a electrician you do a walk-through of your home and get of your issues taken care of at once. You’ll find having the electrician attend to several smaller needs in one visit much more cost effective. you can enjoy now and benefit from when you sell your home. In selecting a contractor, it’s not a good idea to pick one based on hourly rate alone. Ask questions. Contractors with low hourly rates may add on separate fees or take longer to get the job done to offset the lower rate. Ideally, it’s best to protect yourself by requesting a firm quote for work you want done up front. Go With an Electrician You Can Trust! Choosing a Tiger Electrician is the best way to ensure that all of your electrical work is perform correctly the first time, which will save you a lot of money on future repairs. Call 1.888.9TIGER4 or visit our website to schedule an appointment with a professional electrician today! Be sure to check out Tiger Plumbing, Heating, Air Conditioning and Electrical Services on Facebook, Twitter, Pinterest, LinkedIn and Instagram for more valuable information! Furnace Season Has Arrived! But Wait…What is That Smell? It looks like fall weather has finally arrived in the Midwest and most of us will be giving in to the cold weather and will be turning on our furnaces. 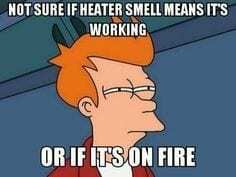 And what’s the first thing you will likely notice when that furnace kicks on? A strong odor that lets you know winter is on the way. But what causes this odor and should you be concerned? That odor you’re noticing, when you first start-up your furnace could indicate a health risk! The odor is often caused by airborne dust and household chemicals that have settled on the furnace. These are “burnt” off as the furnace heats up. 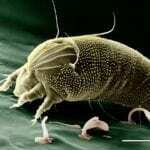 The main source of this problem is from unclean or poorly filtered ductwork where dust, pet hair and debris have settled and decayed over the years. This debris build-up not only creates that unpleasant smell, but it can also be a fire risk. For your safety and to improve your indoor air quality you should have your ductwork expertly cleaned by a trained professional. Another potential cause of your furnace’s odor is an old, dirty air filter. If you can’t remember the last time you changed your air filter, you need to do that right away! 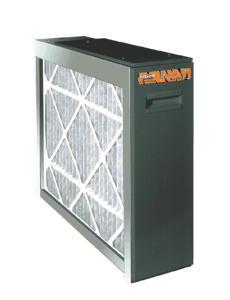 There are also products and air filters designed to not only improve your indoor air quality and health, but they also run more efficiently, are designed to save you money and require less maintenance. To have all of your ductwork professionally cleaned and have your air filter changed or upgraded call 1-888-9TIGER4 or visit TrustTiger.com today!